Lower your breakeven point and hang on to your cash reserves. Many businesses did survive the recession and remain profitable. They are the businesses that have a greater proportion of variable costs (lower fixed costs), and, therefore, shoulder less risk. You see, businesses with more variable costs in lieu of fixed costs are less susceptible to sudden changes in sales volume. Variable costs rise and fall in proportion to sales and result in a lower break-even point of sales. This gives retailers an advantage over their competition in that they have more time, or room, before their cash reserves are depleted during a sudden sales slump. This article will demonstrate how to calculate your break-even point of sales. It will also provide some real world examples of ways smart retailers are reducing their break-even points. Finally, at the end of this article is an offer to get a free break-even calculator that you can use to improve your business. So, what is the formula for break-even sales? Fixed costs: These are costs that do not change when sales fluctuate. Examples are administrative costs, occupancy costs, and salaries. Variable costs: costs that go up and down with sales. Examples are cost of goods sold, sales commissions, finance company fees, and credit card fees. What complicates the retail costing environment are the mixed costs. They are a mix between fixed and variable costs. Examples are: advertising costs, distribution costs, and customer service costs. To get a firm grasp on how mixed costs affect your business you need to ask yourself: if sales go up or down… does this cost stay the same and, if not, how much does it fluctuate? Once you have a good grasp of your cost types, you can calculate your contribution margin ratio. This is the point where fixed costs are covered. Any sales above that level contribute to profits at your contribution margin rate. Contribution margin % = ($6,000,000 - $3,800,000) / $6,000,000 = 37% (rounded up from 36.67% for this article). What does a contribution margin ratio of 37% mean? It means that after fixed costs are covered, 37% of any sale is straight profit. The remaining 63% are variable costs. 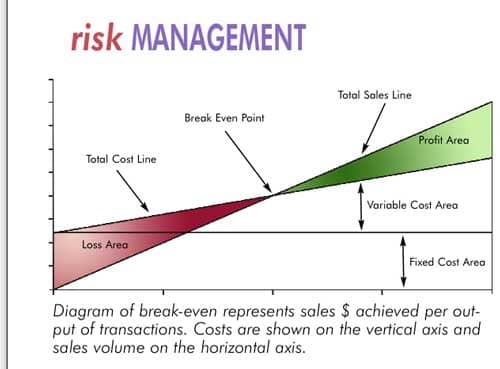 So once you know your fixed costs, variable costs, and contribution margin you can easily figure your break-even point of sales. However, we all know that is only used in a metaphorical way when thinking in terms of a calendar year. Profit is made each and every day once you crest your daily break-even point. But due to the weekends being responsible for the “lion’s share” of business, you should express your break-even as a monthly sales threshold. The monthly break-even sales level for XYZ Furniture Store is $4,054,054/12 =$337,837 (without seasonal fluctuations). This is the minimum level of sales that adds to cash rather than subtracting from it. Now that you are tracking break-even properly, you CAN improve it. It’s never too late to switch fixed expenses to a variable structure or transition to a greater variable proportion of mixed expenses. This will reduce your risk exposure (financial leverage) and maximize cash flow over the years. Use a Contribution Margin Financial Statement so you can easily calculate your break-even every month. This consistent tracking enables you to react FAST. Increase availability of warranty programs. If a dealer increases GM, their BE falls. Warranty is the fastest way to increase GM$ because when sales go up, Cost of Goods Sold goes down, and BE decreases. Use variable sliding sales commissions on gross margin. Pay delivery crew by the stop or piece rather than on salary. Set departmental budgets based on sales levels rather than just dollar levels – administrative, warehouse, and advertising. Renegotiate rent as a percent of sales rather than fixed cost. Track return on advertising dollars more closely with respect to selling opportunities and traffic online and offline. Employ efficient systems, procedures, and equipment in business operations. Develop effective and fair vendor credit programs. Pay managers and owners as a percent of sales and profitability rather than just straight salary. Invest in advice and training that impacts profitability and improves sales. Now that you have some practices that will decrease break-even, what results can you expect? Please refer to the spreadsheet on the following page. 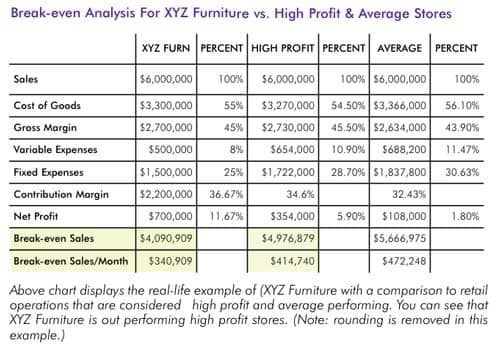 Again, XYZ Furniture is generating $6,000,000 in annual sales. First let’s figure net income using the formula: Net income = Sales – Variable Costs – Fixed expenses. In this example, the company has a net income of $700,000 per year = $6,000,000-$3,800,000-$1,500,000. That’s a 12% bottom line ($700,000 / $6,000,000 = 11.67%). And, by the way, this is a real furniture retailer that brought 12% to their bottom line last year! Here is a little bonus calculation for you. What if you have done everything you possibly could? You have established the lowest break-even possible with your individual circumstances. Now, you want to figure out how to prosper further. How many extra sales dollars do you need to produce your desired profitability and subsequent increase in cash flow? This was all done in seconds from their contribution margin financial statement. We joked that it took longer to have the printer generate the paper than to answer this important question. We all agreed that with proper management, training, and execution an extra $100,000 was possible! The lesson here: Think PROFIT first and then translate that to SALES. Some powerful analysis tools have been presented in this article, but you can create a more automatic Contribution Margin Financial Statement directly from your data. Contact David at davidm@furninfo.com to arrange a discussion about figuring your break even. David McMahon is a management consultant for PROFITconsulting, a division of PROFITsystems, Inc. For a complimentary discussion and demonstration of how you can become a better retailer and e-tailer, contact David at davidm@profitsystems.com.